America's most highly regulated housing markets are also reliably the most progressive in their political attitudes. Yet in terms of gaining an opportunity to own a house, the price impacts of the tough regulation mean profound inequality for the most disadvantaged large ethnicities, African-Americans and Hispanics. Based on the housing affordability categories used in the Demographia International Housing Affordability Survey for 2016 (Table 1), housing inequality by ethnicity is the worst among the metropolitan areas rated "severely unaffordable." In these 11 major metropolitan area markets, the most highly regulated, median multiples (median house price divided by median household income) exceed 5.0. For African-Americans, the median priced house is 10.2 times median incomes. This is 3.7 more years of additional income than the overall average in these severely unaffordable markets, where median house prices are 6.5 times median household incomes. 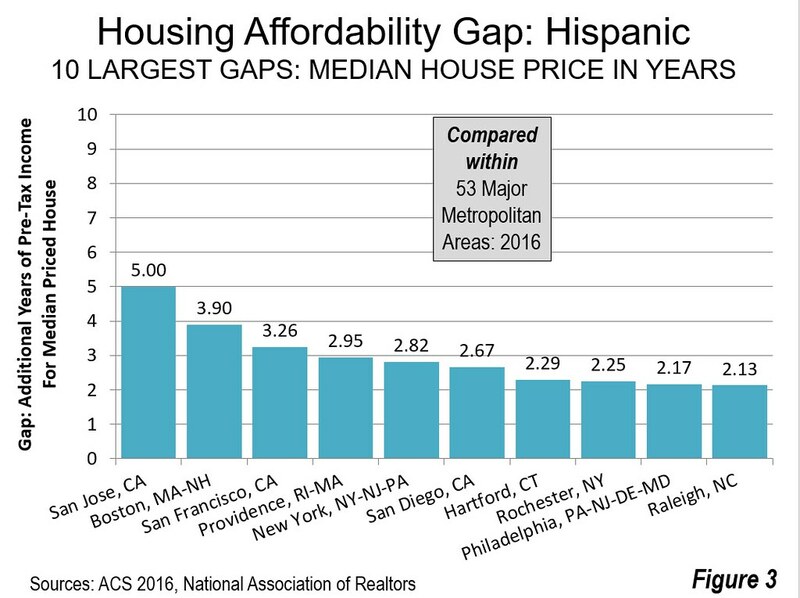 It is only marginally better for Hispanics, with the median price house at 8.9 times median household incomes, 2.4 years more than the average in these markets (Figure 1). 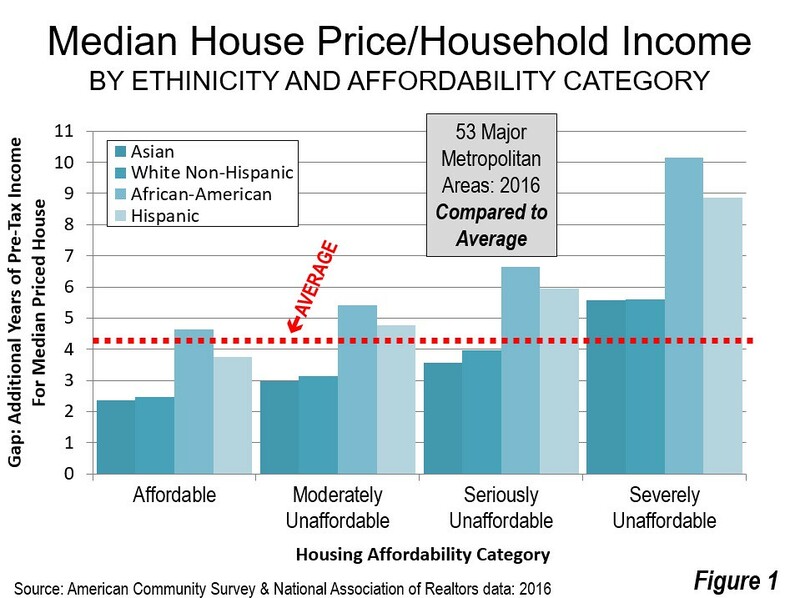 Among the four markets rated "seriously unaffordable," (median multiple from 4.1 to 5.0) the inequality is slightly less, with African-Americans finding median house prices equal to 2.2 years of additional income compared to average. The disadvantage for Hispanics is 1.5 years. In contrast, inequality is significantly reduced in the less costly "moderately unaffordable" markets (median multiple of 3.1 to 4.0) and the "affordable" markets (median multiple of 3.0 and less). 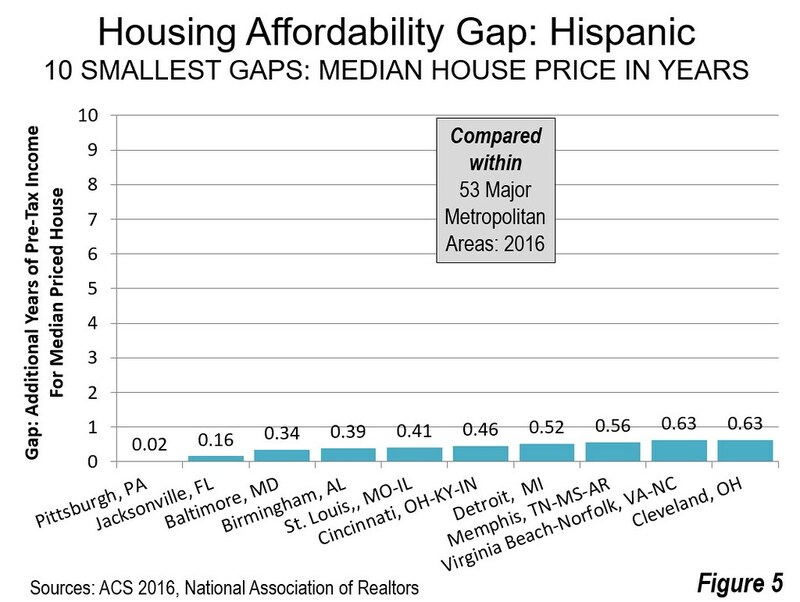 able 2 illustrates housing affordability gaps by major metropolitan areas. There are also housing affordability ranking gap tables by African-American households (Table 3) and Hispanic households (Table 4). 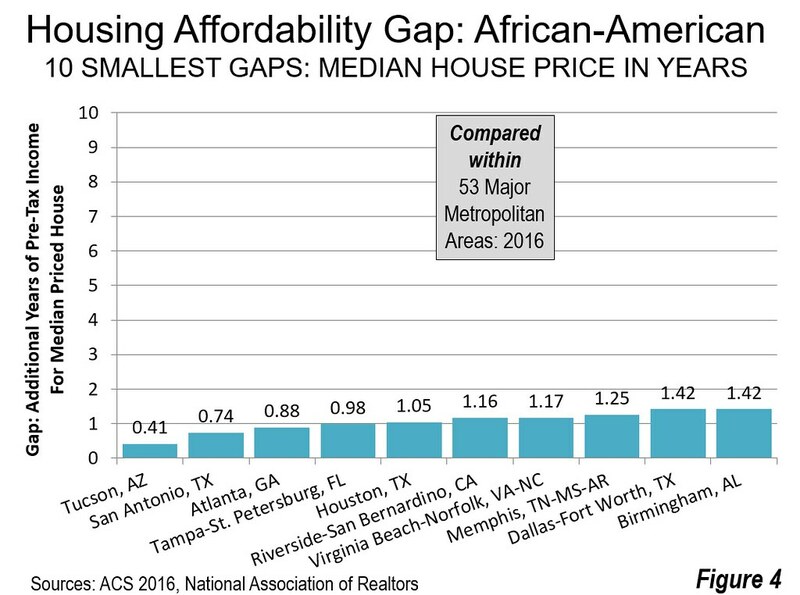 African-Americans have the largest housing affordability inequality gap. And these gaps are most evident in some of the nation's most progressive cities. The largest gap is in San Francisco, where the median income African-American household faces median house prices that are 9.3 years of income more than the average. 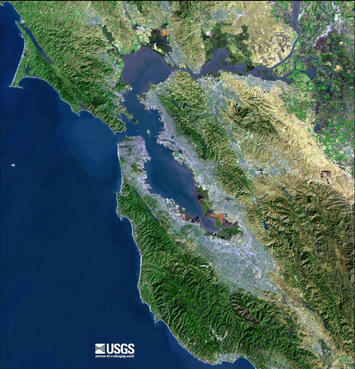 In nearby San Jose ranks the second worst, where the gap is 6.2 years. 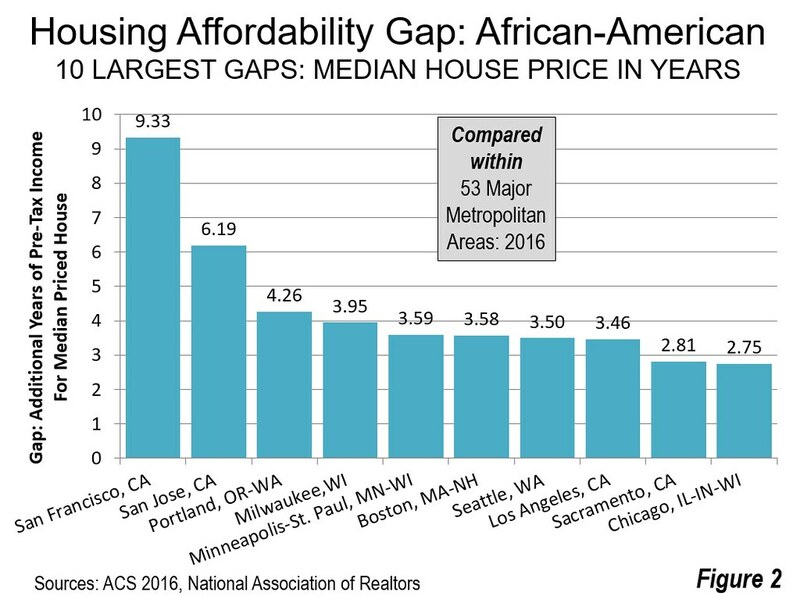 Overall, the San Francisco Bay Area suffers by far the area of least housing affordability for African-Americans compared to the average household. The San Francisco Bay Area: "Inequality City"
Moreover, no one should imagine that recent state law authorizing a $4 billion "affordable housing" bond election will have any significant impact. According to the Sacramento Bee, voter approval would lead to 70,000 new housing units annually, when the need for low and very low income households is 1.5 million. The bond issue would do virtually nothing for the many middle-income households who are struggling to pay the insanely high housing costs California's regulatory nightmare has developed. Overall median multiple from Demographia International Housing Affordability Survey: Updated with revised income data from 2016 ACS.